Toys, gadgets, puzzles and gizmos – not quite the lineup of items you think of when it comes to science. However for Ross Kelly, these items are exactly the tools that he uses to teach. 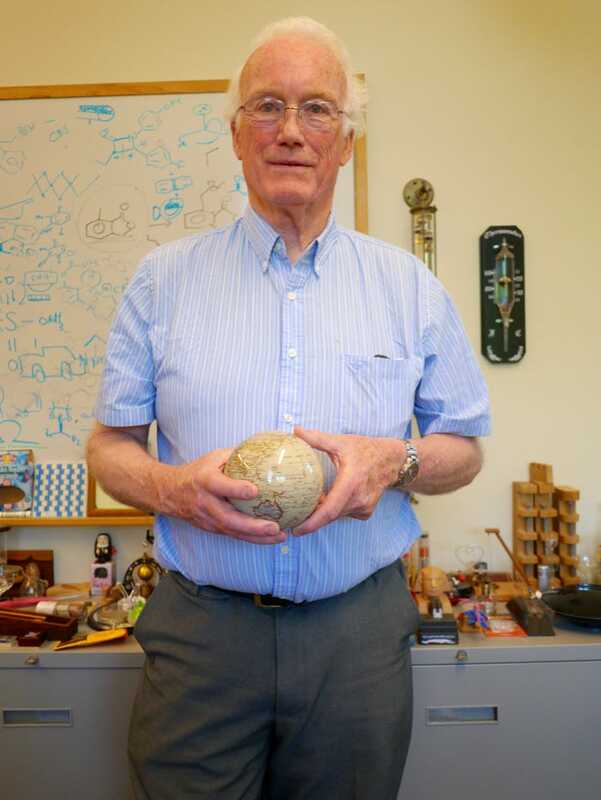 It started for the Boston College organic chemistry professor three decades ago, when he purchased a soccer player figurine that was able to “levitate” a ball from a steam of air coming from its head. 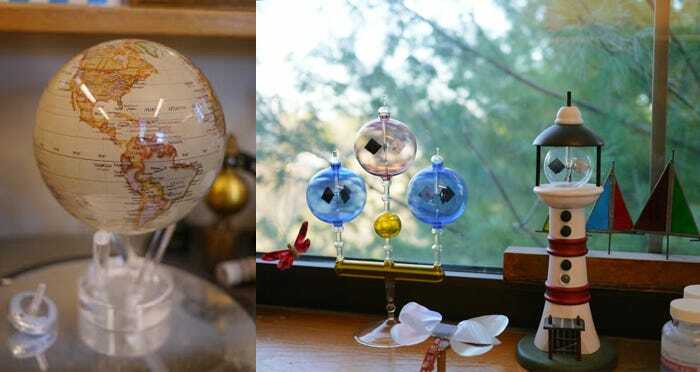 The science behind the intriguing toy fascinated Kelly so much that he began purchasing more items from offbeat souvenir stores, airport shops and online sites and became determined to use them to inspire curiosity and wonder in others. 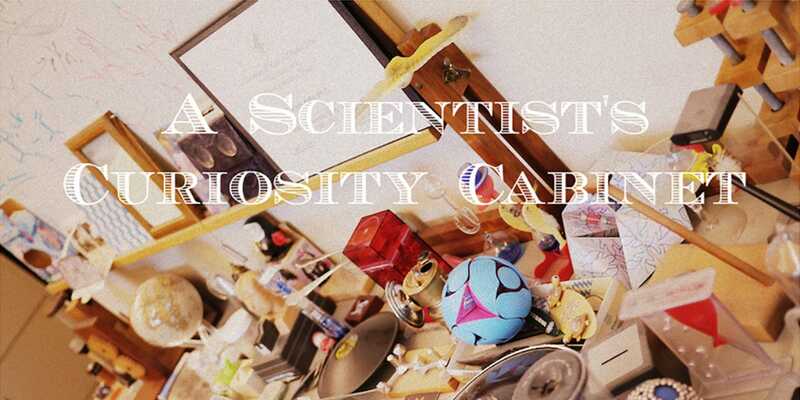 Since then, he has assembled a collection of over 75 eccentric gizmos and toys, dubbed the “Curiosity Cabinet” collection, that he poses to students to get them to think about an aspect of the world and foster a hands-on approach. We spoke with Kelly about how he started his curiosity cabinet, his goals for putting the collection together, and his thoughts on how people can engage with science. What is a scientist’s “Curiosity Cabinet”? To me it is a collection of gadgets, devices, gizmos and other things that I have collected over the course of 25-30 years which are all science related and are either, to me, neat examples of scientific principles, or things that you look at and say “that’s impossible”, except it’s staring you in the face. Historically, curiosity cabinets have been around for centuries, and were especially popular during the Victorian era. They are collections of things that the original collector thought were novel and interesting. What got you started on your own Curiosity Cabinet? The first thing that I remember buying (some 25 or 30 years ago) is a battery-powered doll that I saw in a newspaper vendor’s stall in Milan, Italy. The doll was about 6” tall, and dressed in the uniform of the A.C. Milan soccer team. A jet of air was coming out of the doll’s head and was levitating a ball about the size of a ping pong ball in the air above his head. It is an example of Bernoulli’s Principle, the phenomenon that gives lift to airplane wings. In the summer people sometimes see the same phenomenon in department stores where a beach ball is levitated above a fan that is blowing vertically. Many of the things in the collection are favorites, because almost everything in it is on my A list. I have a bookcase at home full of the B list things that did not quite make the cut. Among my most favorite are the MOVA Globe, something called a Döbereiner lighter – which was a way to get a flame easily before there were matches – a potato cannon and also a carbide cannon, radiometers, a Galileo thermometer, and some other thermometers, to name only a few. What were your initial thoughts as to how the MOVA Globe worked? When I saw it in a shop in Maine several years ago I couldn’t figure out how it worked, which is what tantalized me enough to buy it. Even after I bought it I couldn’t figure out how it worked. The brochure that came with it mentioned that it was covered by a couple of patents, so I asked our science librarian to get me a copy of one of the patents, which she did. It had a very useful diagram that allowed me to understand some of how the Globe works. I explain how it works on the website. Were there any challenges to putting the collection together for public access? The main challenges were that I am not very good at videoing things and I didn’t have a clue about constructing a webpage. Fortunately, two undergraduates, Jacy Lundberg and Omar Khan, whom I had gotten to know because they were students in my Organic Chemistry class, jumped at the opportunity to make the webpage, and several months of part-time work on the part of all three of us produced it. How have people reacted to the collection? The webpage was written up in the Boston Globe, the chemistry weekly trade journal Chemical and Engineering News, and a number of other places. It has received more than 50,000 page views as of April, 2015, and that number increases every day. The feedback has been uniformly positive. I have received emails from many high school and other teachers complimenting us on the website and saying that they have posted it or otherwise passed it on. What do you hope students, and people in general, gain from the Curiosity Cabinet? My hope is that the many people who are unfamiliar with science or are afraid of it will learn that it can be interesting and fun. If the webpage turns some people on to science, then it will have achieved what I had hoped. What do you think is the best way for people to learn science? I think the best way is by actually doing it and having fun with what one is doing. When I was a kid back in the ‘50s, I and my friends did all sorts of science although we did not call it that. Making rockets and bombs from scratch, building a motor scooter from a bicycle frame and a lawn mower engine, getting the engine to operate properly, playing with a chemistry set (there are virtually no interesting chemistry sets anymore, because everybody seems to be worried about getting sued) all taught us science. My brother is a fruit farmer in California growing peaches and nectarines. Although he doesn’t call it that, he does science every day, whether it involves setting out pheromone traps to monitor insect populations, formulating sprays to combat mildew or adjusting a carburetor on a tractor. What advice do you have for aspiring scientists and those who just want to get into it? I would suggest making friends with other kids who like science; joining (or even starting) science clubs at school, asking teachers, joining Boy or Girl Scouts – they have lots of science activities, 4H (farming and raising animals is full of science), googling or searching YouTube using terms such as science, chemistry, physics, biology, rockets, pinewood derby, etc., etc. Reading labels on foods and other things and asking “what is that?” and “what is it for?” and tracking down the answer. Unlike a lot of things on the web, the science on Wikipedia is usually correct, so if people look topics up there, they can trust the science to be right. Watch “Bill Nye, the Science Guy” and some of the other science shows on TV such as Modern Marvels, The Discovery Channel, The History Channel and PBS. And just be curious about everything. My favorite students are the ones who are curious. Could you tell us a little more about the research and work that you do at Boston College? I am an organic chemist, which means that I work with molecules that contain carbon. More than 99% of the molecules that exist, and there are somewhere around one hundred million different kinds of molecules known at the moment, contain carbon. I teach Organic Chemistry to undergraduates and graduate students and I do research in the area of organic synthesis, which means that I am working on ways to either make something or to find out better ways to accomplish making things. Some of the molecules we seek to synthesize occur naturally and have important biological activity; they also offer intellectually stimulating challenges for developing efficient ways to make them. Other projects that we work on are molecules that we have designed to achieve a particular purpose. For example, about fifteen years ago we published a paper in Nature on the synthesis of the first man-made molecule that functions like a motor. To learn more about Ross Kelly and view his entire Curiosity Cabinet, visit his online collection at https://sites.google.com/a/bc.edu/curiosity-cabinet/. To see one of Kelly’s favorite gizmos in person, find a MOVA Globe Retailer near you and read about the science and materials behind the MOVA Globe technology. We hope our discussion with Ross inspired you to develop your curiosity for the world and see that science doesn’t have to occur inside a laboratory. Perhaps, you might even assemble and share your own modern curiosity cabinet. How are you using science in your everyday life? Let us know in the comments below or on Facebook. Images provided courtesy of Ross Kelly.